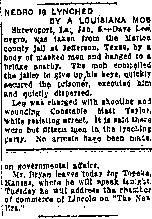 Killed January 3rd, 1914, near Jefferson, Texas. Lee was removed from the Marion County jail after the jailer surrendered his keys to a group of 15 men. There is no evidence of resistance on the part of the jailer. No arrests were made, and no officers were disciplined for losing their prisoner. Some accounts of the incident list his name as Dave Thompson.